When we talk about project management tools, we often think about gantt charts, project plans and project reports. But when the user is a PMO officer, things are quite different. You probably haven’t thought of all these apps to help you manage your project portfolio. One of the major responsibilities of a Project Management Office is to adopt a technological suite that supports the daunting mission of coordinating the entire project portfolio of an organization. Additionally, many projects have a heavy data print, often in the form of unstructured data, or data without a clear impact on work quality. However, being able to make decisions based on the analysis of those type of untapped data is extremely important for both project leaders and C-level executives. The PMO in that context should assume a facilitating and catalyzing role. Each PMO officer ought to select with care the technological portfolio that best meets project nature and the governance model. In this article, we recommend several software applications that can be very useful to organize your ideas and have a hold of a complex, corporate project portfolio. Not all of them are project management nor PPM tools, but they all have clear benefits in this world. Consider them for your own toolkit! Demonstrate the benefits of your PMO with ITM Platform. Try the free 14 day trial. Whether it’s for a corporate PMO or an IT PMO; for strategic projects, R&D or client projects, these apps can be an essential part of your daily operations. Because a professional tool to manage your entire project portfolio is the first duty of any PMO. If you don’t already know it, ITM Platform is a cloud-based project, program and portfolio management tool (PPM) with a core strength: it doesn’t need heavy configuration work and and enables an incredibly fast roll-out. With a simplified user experience aligned with the methodological best practices of PMBOK and Prince2, ITM Platform supports the setup of new PMOs with predefined dashboards, customizable reports, plus all the features that a project manager needs. Pros: ITM Platform is the simplest way to communicate the status of critical projects with senior management, letting them know how money is being spent and supporting more informed decision-making. Cons: As with any other PPM tool, an adoption plan is required to manage the roll-out, ensure that all project teams are involved and that the system data are reliable. Want us to show the advantages ITM Platform can bring? Request a free online demonstration. In the 21st Century, information must be visual. If you want to make data analysis, you will at least need a robust project that can visualize project reports and establish dynamic relationships between variables. 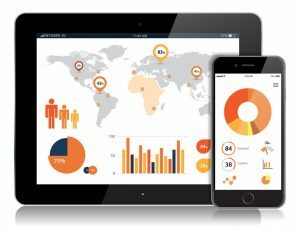 Power BI: SaaS brother of Excel and cousin of Tableau. Excel’s SaaS brother and Tableu’s cousin, Power BI is Microsoft’s data visualization tool. It uses the language M (same as Excel), and can be connected to any external source through API. Pros: Once plugged to your data, it provides a really friendly experience to analyze data… with Microsoft’s quality. Cons: In order to onboard Power BI it’s highly recommendable to get the help of a programmer that plugs into the data sources – small teams and organizations may have issues here. How to connect it to ITM Platform: Follow this basic tutorial to use ITM Platform as a data source through the open API: although the tutorial talks avout excel, it’s really the same code. IT maintenance and software development teams have very specific work management needs. It’s often useful to adopt software that supports change requirement and issue tickets, as well as agile sprints. JIRA, from Atlassian, is the standard product for the management of development teams. JIRA, by Atlassian, is the golden standard for managing development teams. Pros: JIRA makes it really easy to report issues, user stories and epics to development teams, attach supporting documentation, mention involved people and assign tasks to a given sprint. Cons: Reporting is not its most satisfactory aspect. How to connect it with ITM Platform: The native connector allows to send tasks and projects from JIRA to ITM Platform. Just add your JIRA url and actívate the connector! This easy integration allows PMOs to report and control their development portfolio from ITM Platform. If your team doesn’t have a nice communication environment, they will find it somewhere else. I’m sure you know Slack by now. Its combination of IRC-type chat with in-built work management apps has transformed it into a really powerful tool to connect and coordinate teams: channels by project, attachments, checklists, code snippets… While no technology is radically innovative, the product is unbeatable. Pros: Slack’s Marketplace hosts hundreds of SaaS apps that will boost your productivity enormously. Cons: While the freemium option is quite elastic, the cost per user and month is high, but you will have to pay it if you don’t want to lose stored data. How to connect it to ITM Platform: ITM Teambot, ITM Platform’s app for Slack, allows any user find out their assigned tasks and projects, report effort and progress, as well as add comments to their ITM Platform projects, directly from their Slack chat. All PMOs face change requests that exceed by far the capacity of available resources. But before ideas can be analyzed and approved, they must live in one place. The ITM Platform templates in Zapier allow you to collect tasks from anywhere in the cloud. Thanks to Zapier you can send tasks to an ITM Platform project from hundreds of apps, like Gmail, Google sheets, Dropbox, Evernote… If you take into account the possibilities of multiple-step zaps, there are few limits! Cons: Honestly speaking, Zapier is very reliable, and for small data flows it can be even used for free. Of course, the safe bet is to stick to processes that can be automated without affecting performance. How to connect it to ITM Platform: To understand how to set up a zap you can follow our tutorial, use popular zap templates (below), or use this Google Sheets template. 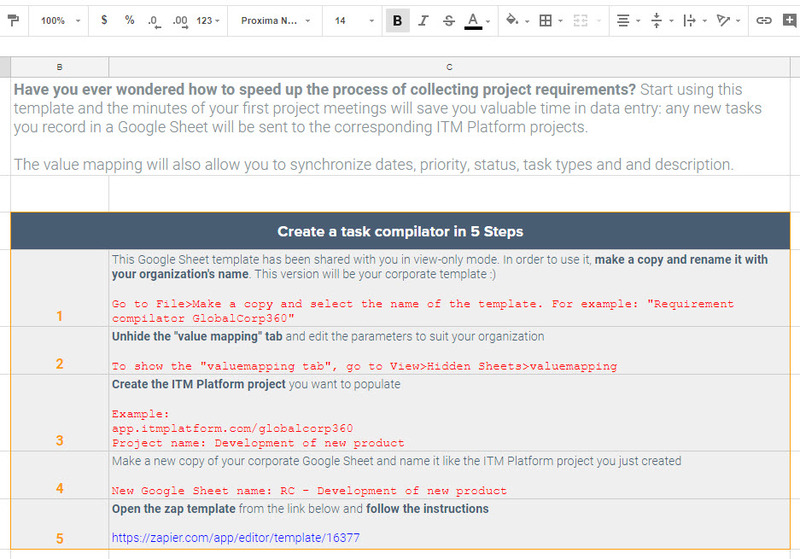 The template to collect tasks in Google Sheet and send them to ITM Platform. Diagramming processes and workflows is one of the most useful ways to promote change, create new procedures and make sure you’re working scientifically towards organizational improvement. A diagrammed PMO is a better managed PMO! Lucid Chart is leader in this software niche. That said, there’s a lot of really trustworthy competitors, and they’re all using similar license plans. Try on your own a couple of them and go with what you like. If the PMO has only a few users, the cost will be neglectable. Pros: Do you want to explain complex procedures that affect different areas of your company? Forget pen and paper. Cons: Very few. In the case of LucidChart, it can even be imported and exported to Microsoft Visio. Big Data won’t be a passing fad for PMOs. If they are in a corporation, they may have to coordinate internal big data projects; in smaller settings, data generated by project teams can be monitored with specific solutions. Hadoop, from Apache, is the well-known programming framework for distributed data analytics. Apache Hadoop is the better known software for distributed data analytics. Pros: The sheer amount of references of documentation that you can fin don Hadoop has no end. Cons: Compared to all the suggestions above, it’s a programming language, and not a finished product –it may escape the authority and skillset of the PMO team.